IFM is an ideal lighter-duty magnifier for low-power inspection and an economical choice for tight budgets. 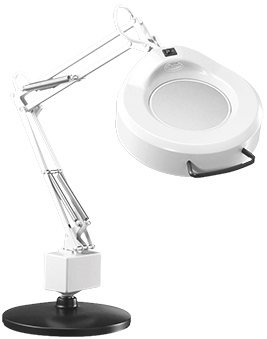 A 5" diameter, 3- (1.75X) or 5-diopter (2.25X) lens provides a large viewing area and a 22W circline fluorescent lamp with built-in starter switch produces 360º shadow-free illumination with just a touch. A lamp diffuser cover protects the bulb from damage. Select models include a 3-wire single outlet receptable at the base of the arm for added convenience. The flexibility of the neck assembly and external spring-balanced arm allow for maximum movement and positioning. Colors: Light grey or white. Stamped steel shade. Color: Light grey or white. Standard with edge clamp or weighted base. 5-diopter (2.25X), 5" diameter glass lenses are standard. STAYS lens can be attached to the primary lens. the base of the arm. External-spring 45" or 30" L-arm.